Our Smithwick’s Experience guided tours run at regular intervals throughout the day, 7 days a week, each tour taking approximately 1 hour. 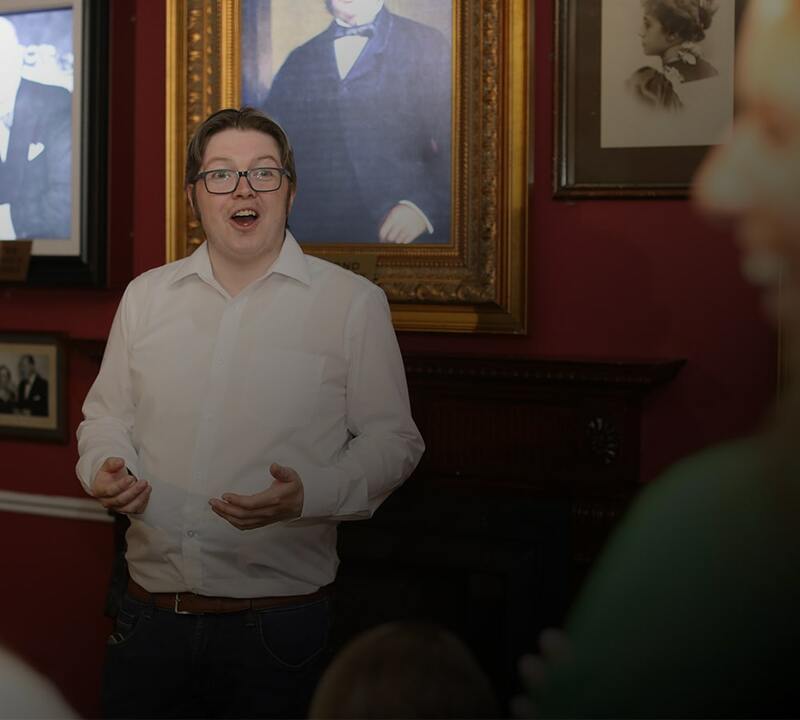 Sharing the experience makes it even more fun, and we welcome groups of all sizes to Smithwick’s Experience Kilkenny. We’re happy to offer discounted rates depending on group numbers. Follow the parade towards Rose Inn Street. Take a left onto High Street and keep straight until it merges with Parliament Street. You’ll find us on your right, just past the Court House. Cross John’s Bridge and take the second right on to St. Kieran Street. Keep on until it merges with Parliament Street. We’re approximately 50 - 100 metres ahead on your right hand side, just beyond the Court House. Public parking is available close to Smithwick’s Experience Kilkenny. When approaching Kilkenny city, take the first exit at the Callan Road Roundabout. Continue straight, go through the mini roundabout and keep straight for 1km until you reach a set of traffic lights. Go through the lights and take a left turn at the next T-junction onto Patrick Street. Turn left onto High Street and keep on until it merges into Parliament Street. You’ll find us on your right, beyond the Court House. When approaching Kilkenny city take the second exit off the Waterford Road Roundabout. Continue straight until you reach the next mini roundabout and take the first exit. Drive straight onto Patrick Street. Take a left onto High Street and continue until it merges with Parliament Street. We’re on the right, past the Court House. Dublin Airport is just 10km (6 miles) north of Dublin City centre. Both airport terminals (T1 & T2) are serviced by frequent bus services to the city centre and beyond. Depending on the day, bus services to Kilkenny are offered by Bus Éireann, Dublin Coach and J.J. Kavanagh Coaches. Dublin to Kilkenny is serviced by Bus Éireann, Dublin Coach and J.J. Kavanagh Coaches. There are typically multiple trips each day. You can buy tickets in advance to guarantee a seat or buy them on the bus. Tour companies Wild Rover Tours, Collins Day Tours and Paddywagon Tours also feature Kilkenny as part of their day tour package from Dublin. Irish Rail operates between Dublin and Kilkenny 7 times a day between 7:25 and 20:08 Monday through Saturday. Sunday’s timetable includes 5 trips between the hours of 9:10 and 20:08. Please note timetables may change. You can purchase a ticket or check your train’s time at Irish Rail’s website. Here at Smithwick’s Experience Kilkenny, our Smithwick’s Retail store offers an exclusive range of merchandise, including customised, engraved glasses. Simply pre-order your engraved glasses when booking online. Simply pre-order your engraved glasses when booking online. 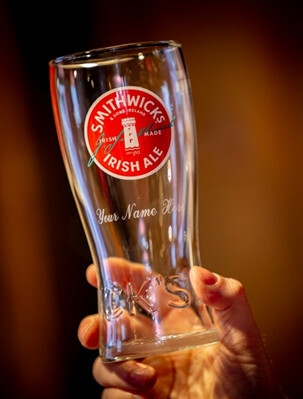 When you arrive at our Smithwick’s store, your specially customised glasses will be waiting for you. You’re bound to have a few questions for us before you get here, so we like to anticipate some of your potential queries. Get in touch if we can be of any more help. We’re open year round, closing only from December 24th– 26th each year. Hours vary slightly by season. Open daily from 10.00am - 6.00pm (last tour at 5.00pm). Open daily from 11.00am - 5.00pm (last tour at 4.00pm). We also offer private evening tours for groups by special arrangement, with advance booking necessary. Contact us at info@smithwicksexperience.com, or call us on +353 (0)56 7786377 for more information. To avoid disappointment, we strongly recommend that you book in advance, particularly during our busy summer months. Luckily, it couldn’t be easier to book your ticket online, with our booking page just a click away. We’ll also give you a discount off your adult tickets when you book online. The price of a standard ticket includes a fully guided tour of Smithwick’s Experience Kilkenny. A local guide gives your tour, which lasts approximately 1 hour, and you’ll enjoy interactive and surprising experiences along the way. Our tours are in English, with the option of a complimentary audio guide in French, German, Spanish and Italian. At the end of your tour, you’ll be treated to a complimentary pint of your favourite Smithwick’s Ale, with soft drinks provided for under 18s. For a small extra charge, you can upgrade your ticket and taste all three of our Ales.